Blog Writer is a clean and minimal blog theme that is built for writers who need to create a personal blog site with simplicity and suttle effects to make readers feel the pleasure of reading your articles. 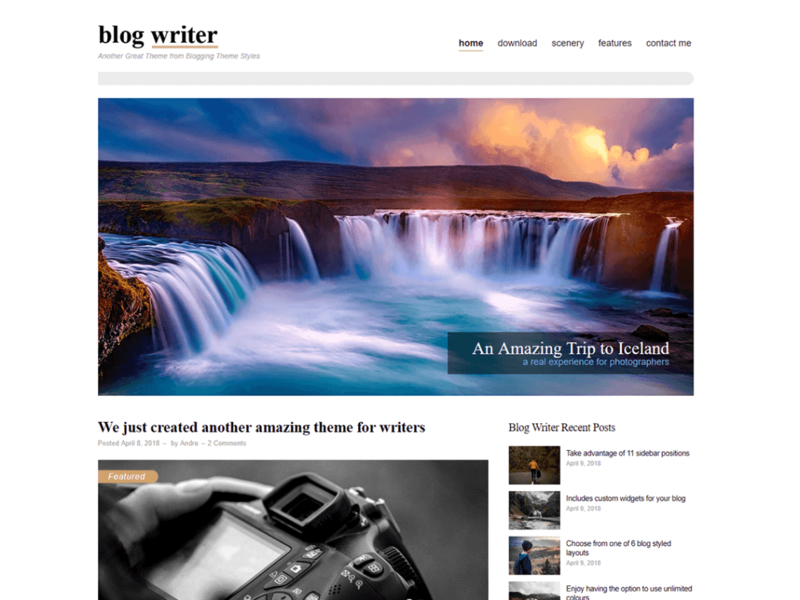 The design concept for Blog Writer includes modern, classic, and minimal styles to give you a simple and clean blog. For bloggers, this is truely a perfect choice for you if you want to only focus on creating amazing stories. It’s super simple and easy to setup while giving you a well crafted blog right out of the box. Enjoy several blog styled layouts that includes a grid layout option, theme customizer, page templates, styled WP Gallery, unlimited colours and more…Be sure to read more About Blog Writer under the Appearance admin menu.